With Wraptor Balance students or novices learn correct technique and avoid bad habits from day one. It provides a stable platform for the beginner or inexperienced person, while getting used to the feel of the racing craft. 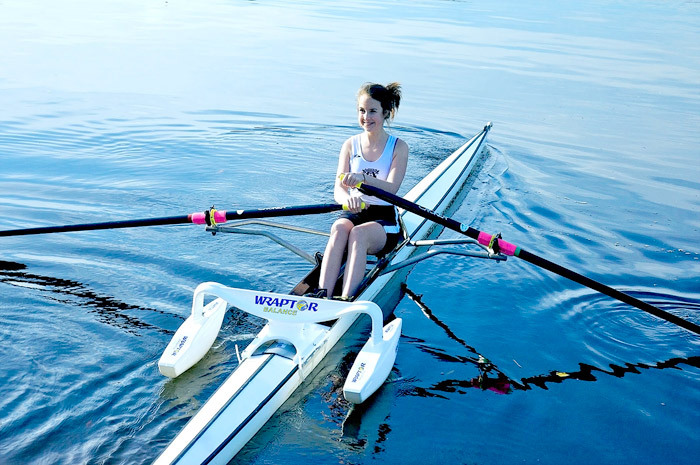 Wraptor Balance builds confidence, and the rower who uses Wraptor balance from the start, will move the boat faster, and more efficiently than the non user, and will probably do so even before they have learnt to feather or square the blades. Technical skills can be learned quickly in a safe environment, avoiding accidents on the water and allowing crews to move up through grades faster. The Reversible fin gives constant measurable resistance for power strokes. Allows the coach to work with their people in a relaxed safe environment. Uniquely, Wraptor Balance allows the coach to teach students how to move the boat efficiently from the moment they get on the water so crews can move up grades faster. When efficient movement has been achieved, coach can move trainees onto other areas of technique, such as feathering blades. Instils good habits from the start. Helps undo bad habits and correct technique. Wraptor Balance means scullers get on the water training with feedback on technique. Easy to attach and detach, making it possible to convert your racing fleet to training boats in seconds – and back again. It takes roughly 10 – 15 seconds to fit Wraptor Balance to an existing boat. This ease of attachment and detachment means that it can realistically be used for specific aspects of a training session – for example the kit could be applied to a boat in order to work on a particular area of the stroke cycle in a stable environment before removing the kit and continuing the training session. Interested in purchasing Wraptor Balance? If you would like to be the first to hear about product news and any special offers we run please sign up for our newsletter.